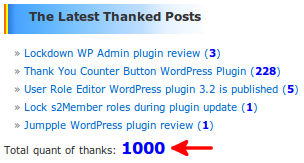 ShinePHP.com got it’s first 1000 thanks from you. It’s so exciting to get your positive feedback and know that you like my work. I’m really inspired to write more getting your appreciation for posts, published here. Your comments and just a single click on this blue button with “Thank You” words on it let me raise my head and know that my work is useful for somebody, that my efforts are not wasted. This leads to positive mood and desire to create more and more, better and better. Thanks back to all of you, who find a second to leave their feedback in form of comment or this appreciation button click. This entry was posted on Friday, September 9th, 2011 at 21:07	and is filed under General. You can follow any responses to this entry through the RSS 2.0 feed. You can skip to the end and leave a response. Pinging is currently not allowed.